My name is Jenny. I’m a writer, spinner, knitter, quilter, bread-baker, and now gardener. (My husband wonders whether I’ll someday run out of new crafts to learn.) My e-mail address is shajen at gmail dot com (you know the drill). I grew up in the Pacific Northwest, where my parents kept a vegetable garden in the backyard and blackberries and huckleberries grew wild just down the street. I can’t say my brother and I helped much in the garden, except by thinning the carrots. (Young carrots, freshly plucked from the ground, rinsed with warm hose water, and doused in lemon juice and salt stashed in the rock wall all afternoon for just this purpose, are the best things on earth.) The first year that we were both teenagers and had finally stopped playing in the backyard, my parents were able to dig up their first fall carrots. Those carrots–long, beefy–lingered in the garage all winter as we slowly ate them down. I first thought seriously about gardening myself when I bought my first house in Dayton, Ohio. I was only in that house a year and only put in a couple of tomato plants, a blueberry bush, and some small sad bulbs. Now I live in Toledo with a non-gardening husband and two vegetable gardens. 2008 is my second year of true gardening, and I’m still learning how things grow (including flowers, the next frontier). In 2009, we hope to move back to the Pacific Northwest, for family and a better environment. I have to admit that moving from zone 5 to zone 8 has an appeal entirely separate from all the other reasons we’re going. 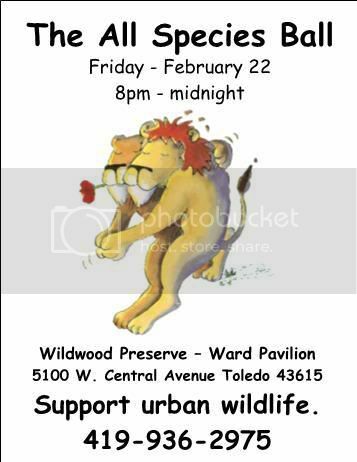 To get warmed up for the Seed Swap consider attending the All Species Ball on Friday February 22nd at the Ward Pavilion of the Wildwood Preserve (5100 W. Central Avenue – Toledo OH 43615)..
Come dressed as your favorite (non-human) species and show your support for our small livestock program that will offer youth in Toledo the opportunity to raise chickens and goats at select urban community gardens. Hope you got out there today, although it doesn’t sound too fun in the snow and cold! Just read your about, didn’t realize you grew up in the NW. I wasn’t much of a garden helper either as a kid, but eventually I got around to wanting to it myself just as you did (and ditto the non-gardening spousal unit too!). Gardening in Zone 8 is probably a heck of a lot easier, as you say. Hope you get to do it someday, maybe as soon as next year! Excited to check out your blog. I’m in Columbus. Any progress on that move back to the PNW? If you end up in the Seattle area, please give a shout! We’d love to have you at our SAGBUTT meetings. Hi, pgg! Sorry I didn’t notice your comment when you made it. I have a friend who gardens in Cincinnati and I get envious hearing about her plants growing always just a little bit before mine do. Likewise, greenwalks. 🙂 I’d love to come to the SAGBUTT meetings–unfortunately we decided to stay in Toledo an extra year, so I won’t be out there until 2010. But only major disaster will stop us from moving then!